Cat Tails - Got a story? We've got a place to put it. Please send in a WORD document, and if you've got photos can post one or two for the story. Prefer small file sizes (under 256kb preferably). The following summarizes my solo trip on our Menger 23 Caerulean III, from Solomons, Maryland to Blue Hill, Maine. Much as I wish the trip to have been undertaken fully under sail – it was not – my goal of getting safely to Maine by the most direct route was successfully accomplished in July of 2014. I kept within a desired schedule that had sufficient margin added to accommodate inclement weather. 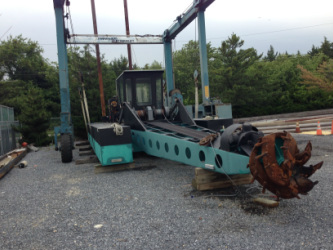 With our move from Solomons, Maryland to Blue Hill, Maine for retirement, my goal was to move Caerulean on its own bottom, leaving soon after my last day of work. I was ultimately completing a trip up the east coast that started in Ft. Pierce, Florida in 1999 as we moved up to Annapolis, Maryland on our previous boat, an Island Packet 35. Both moves went pretty much according to plan - except for the lack of good sailing wind or its unsuitability for safe sailing. That differed from my 1994 trip on the same Island Packet when we moved from Anacortes, Washington to San Diego, California with wind ranging from zero to over 35kts – the latter almost exclusively from behind that lead to some great surfing, albeit in a much larger boat! This was planned as a solo trip with only one on board (me), much to the chagrin of my wife. Based on advice she obtained from a client whose husband had completed a Newport to Bermuda race (and then my own homework), I got “permission” to procure an Automatic Identification System (AIS) system to add to the boat’s limited electronics, which had consisted of am ICOM radio, Standard depth sounder, Garmin handheld GPS and a CPT Autopilot I’d added “on my own…” in June. With the AIS she was able to sporadically track me on the web using a free application (Marine Traffic), as well as from their web site - www.marinetraffic.com/en/. Since Caerulean has a Type B transponder (weaker than commercial Type A systems) I had to be reported by a Type A transponder to be seen by the Web. That unfortunately did not happen as much as I thought it would. After some easy research online, I now understand that the clutter of seeing all the boats using AIS, as seen by commercial users, would be cumbersome at best. Despite that, it worked exceptionally well on the boat and I could even control and see the system reports via a Wi-Fi link to my iPhone. I’ll also note that I used the CPT Autopilot almost 95% of the time underway which let me safely and comfortably attend to the boat - and sleep underway later in the trip. Friday 11 July: I departed Solomons at 0435 (time will be in a 24hr format) and made a relatively long day of it since there was really nothing else to do. Calm water, other than the incessant rolling caused by passing powerboats (a lot) was interspersed by thoughts of sailing in a cooler and quieter environment – hopefully with some wind. At the end of the day I’d spent 11.5 hours on the water traveling virtually a single northward course while trying to hide from the blazing sun under the shadow of the boom when I could. The autopilot certainly let me move about to do just that. Despite a teasing wind that came and went just as quickly, it was to be my only day with the sail up (brief at that) until north of Cape Cod. The wind that day allowed me to motor sail briefly, until it shifted to the North (par for the course), and helped to briefly shade me in the cockpit. I used my “Guide to Cruising Chesapeake Bay” to make my decision on where to spend the night and decided to make for Fairlee Creek, located roughly 18nm north of the Chesapeake Bay Bridge. Averaging just over 5kts at 2800 rpm (I was in no great hurry), I anchored in the creek by 1815. The creek and its entrance were just as described in the guide with a narrow channel to respect on both sides which led up to a equally narrow (~50ft) yet deep entrance, bounded by a resort like area (trailers, beach cabana’s and bar, and a large marina) to port and a sandy spit of land to starboard. Behind the spit the powerboats beached their craft during the day and sought out any breeze coming off the bay over the 30-50ft wide barrier. This was really the first place on the bay I’d experienced the effects of the tide as it flowed at 2-3kts through the narrow opening. I sought some distance from the marina and bar areas, seeking some silence I hoped I’d get that night. It worked only to a degree since sound traveled well – even in the hot humid air. After taking a swim, cleaning the slime from the boat’s hull and scraping a few barnacles from the prop that had seen limited use over the last few months, I fixed a light dinner using the lettuce I’d brought - before it went bad. The evening was used for checking the weather and making plans for the next couple of days, as best I could, while listening to the music coming from the Mears Great Oak Landing Marina, and rocking in the wake of the passing powerboats as they came and went – one in particular – incessantly. Saturday 12 July: I departed Fairlee Creek making a relatively short run with the tide that took me north to the C&D Canal and Chesapeake City, Maryland. I easily made my planned "Late" start at 0630 and made it to Chesapeake City, dropping the hook at 1045. There was little to no wind the entire day so there was no sailing, but had a great motor passing diverse areas ashore from a very large and crowded (it would seem) trailer community (over 100 homes) on the water with its own beach, roads, and golf cart transportation, to a massive and beautiful mansion (10,000 sqft+) that fit its environment. Most if not all of this I would not see again any time soon. I was a bit amazed at the number of varying developments and individual houses that far north on the Bay but it is closer to Wilmington and Philly - so makes sense. We saw a lot of diversity along the ICW as well – especially in Florida. While there were no large boats (i.e. commercial) at all, just a lot of powerboats and an occasional sail - all under power that day – I did accompany a 50ft Catamaran for most of the AM into the canal. While following the catamaran, just before entering the city marina area, the male at the helm decided he needed to get ready to for the day’s festivities and promptly dropped his shorts to change into something more formal. I guess he forgot I was there or didn’t care. His wife did not do the same. The toughest part of the entire day was anchoring and having to deal with a launch ramp close by with jet skis and other motor traffic for the better part of 8hrs. It was interesting to watch as I baked in the sun with little shade and only a slight breeze to cool me off. The water was not inviting and I was able to cool myself off using my deck wash hose and adequate water supply. Just before dark a somewhat battered 27-30ft sailboat - flying a Canadian flag - entered the anchorage and two young males were soon seen actively conducting maintenance at the top of the mast for what eventually was over 3hrs. The one at the masthead finally came down well after dark and hopefully completed his work – whatever it might have been. I was amazed at their homemade rope harness and his ability to sit in it for so long without relief. I could hear their French Canadian accent from across the water but never heard a sound when they left before I did the next day. 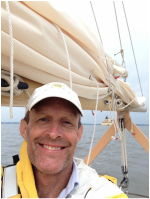 Sunday 13 July: I departed Chesapeake City with a chance to get some help from the tide on my way east and to the Delaware River. It was a smart thing to do as my planned day was long and the forecast was somewhat dubious for good wind. I was underway after pulling the mud-encased anchor at 0435 - close to my planned departure time as I could make it. The pulling up of the anchor necessitated a good cleaning of the anchor and deck in the darkness with the same for my hands (yech! ), before settling into the cockpit to motor out into the canal. It was utterly calm through virtually the entire trip east in the canal and the forecast was for southerly winds up the Delaware. Sure enough, the wind picked up as I turned the corner into the river. I was alone for the entire canal transit making most of it in darkness, though no light was needed. The canal was well marked and lit along its sides for the commercial traffic it was intended to service. I entered the Delaware to a southerly breeze that was fairly light at first but changed dramatically later in the day. I’d never been on any part of the river and its immensity was insightful, especially when I transited from the “River” to the “Bay” where land all but disappeared, except for what I had passed in the proceeding hours. The one landmark seen for much of the day was the nuclear reactor cooling tower and its steam that rose, and just as quickly transitioned into the horizontal in the aloft winds. With little traffic to watch and a single lighthouse to pass in the middle of the river my focus was almost exclusively on getting to Cape May before dark given the winds, waves and then the shifting current that slowed my progress under power to 4kts at best. As most will know and many may have experienced, a catboat heading into the wind and waves is slowed by its hull shape that does not cut through the waves as well as many more modern hull shapes might – though not all. Its relatively flat hull area forward also has a tendency to rise on a wave and pound on the next, beating it into submission. What I experienced for well over 6hrs in the River and Bay was a southerly wind slowly rising to approximately 20kts and short steep chop that seemed to have no rhyme or reason, changing direction and time between sets to compound my travel south. Compounding the problem was the current that flowed south into the wind (i.e. larger seas). Despite the fact the tide shifted to the south with the wind the force of the wind grew and the chop only increased. I had experienced all of this wave and wind action before on my catboat while living on the Chesapeake Bay so it was not new, and I actually was completely dry until the last 3hrs of the trip. After I visually sighted the cape and got my bearings the wind grew to over 20 and the chop increased, providing me with a regular shower of salt water over the bow that was forced aft by the wind and down my neck as I ducked to avoid it in my face. I was almost there. I made for the north channel the Lewes Delaware Ferry uses in its run across the Delaware Bay and easily identified it with help from the ferry I followed in that afternoon as the wind and waves reduced after entering the breakwater and I shed my wet gear in the still warm and humid air. I entered the breakwater at 1645, just a bit over 12 hours from start to finish that day and made my first call to reserve a slip from the calm of the narrow canal using an educated guess at the best place to stop for the night (i.e. the one on the south side of a large bridge at the end of the canal and closer to town). I made for Utsch's, which in the end was a good decision it would seem. It was not a new or modern marina by any stretch of the imagination, but it was VERY welcoming and all of the employees were helpful as I settled into a protected slip after filling my fuel tank and containers (I carried 32 gallons total). My initial assessment of the weather (and confirmed later that night) was to wait for 2 days and see. Now it was time to quickly obtained a shower in an exceptionally nice facility that included a laundry, marine store and most everything I needed while I waited. Monday 14 July: This was the first lay day after assessing the weather that foretold of two or so days of high winds and rough seas off the coast, that as it turns out was very accurate. I met and talked to several in much larger boats than mine (2+ times larger), who had made the transit down the coast to Cape May or had come down the Bay like me and who had experience the same weather I had. What I thought funny was the perception all had of their experience and I would find it interesting to have changed places – they in my 23ft catboat specifically – and then see what they thought…. Though the rain held off for most of the next couple of days the wind did not and it gave me time to find The Lobster House - WOW! It took little exploring in the AM to find the Lobster House just a short walk from the Marina and it looked and smelled like the real deal (lots of fish moved and a large restaurant business with people coming and going long before the lunch hour) - so I decided to give it a try for lunch. 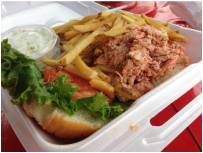 I ordered a well priced lobster sandwich (not roll) and was a bit apprehensive, thinking of a dinky roll with a bit of lobster in it, but that was NOT the case. 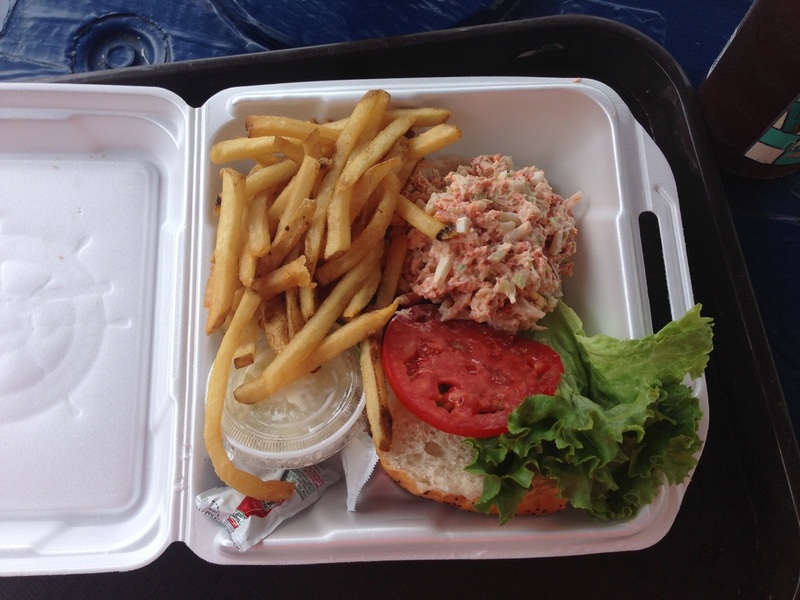 If the only thing I did that day was digest my Lobster Sandwich ($10.25! I might add) – with lots of fries too, which surpassed any expectation and experience I've ever had. The day was a success. Photo below. Tuesday 15 July: This was another lay day and another to get another lobster sandwich I even bought an Oreo Brownie to save for later, though it did not last long! I walked around the marina and talked to workers as well as cruisers today and developed some thoughts/observations on the area I had never visited before, which I summarized below. 1. There are VERY few sailboats in the marina except for transients - none in the slips but for one that is close to the entrance - an anomaly. Why? New Jersey and specifically the canals and Intracoastal channels and associated marina areas have what appears to be a huge problem that has been ignored in as great a scale as the national highway infrastructure of the US. Only the latter gets in the news albeit briefly! At low tide in this particular marina many power boat slips were so shallow at low tide that it would have been impossible to leave or enter the slips. In speaking to several of the guys working in the marina they all remember in their lifetimes when outside the marina it was 35' deep. In most places now it is impassible for all but jets skis and very shallow draft boats. It is an issue up and down the entire length of NJ - and very much the same, but perhaps less so, all the way to Florida. 2. Why is this a problem for NJ? It is the recreation and the income it brings for many in the state. If a Marina can’t support its slip holders with the space they need they leave. If there are no boats to pay the taxes that should pay for improvements, etc. then people go elsewhere. And in the case of places like Cape May, if it all silts in, there is no Cape! Sometimes separation from the mainland is a good thing, and in many cases it makes the places unique and worth visiting. 3. 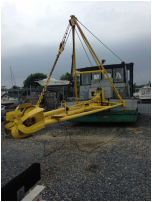 In talking to the guys about one of their dredges at the marina, it took 7 YEARS to get a permit to dredge and not one thought anyone in the government knew what they were doing - bureaucracy at it's finest, and I would have to agree. The longer you wait the harder it is to fix the issue. Regular maintenance is always better than complete rebuilds - or the lack of it. Utsch’s marina has been at this a long time (50’s) and owns their own equipment that they are now readying to begin so minor dredging (sorely needed). 4. So where does that tax money go? Wednesday 16 July: I woke at 0600 for a planned breakfast at the Lobster House and faired rather well I must say with a large cheese and mushroom omelet and hash browns (both excellent) for only $5.50. Of course my $3.50 fresh squeezed OJ and Coffee added to the bill but it was well worth it. 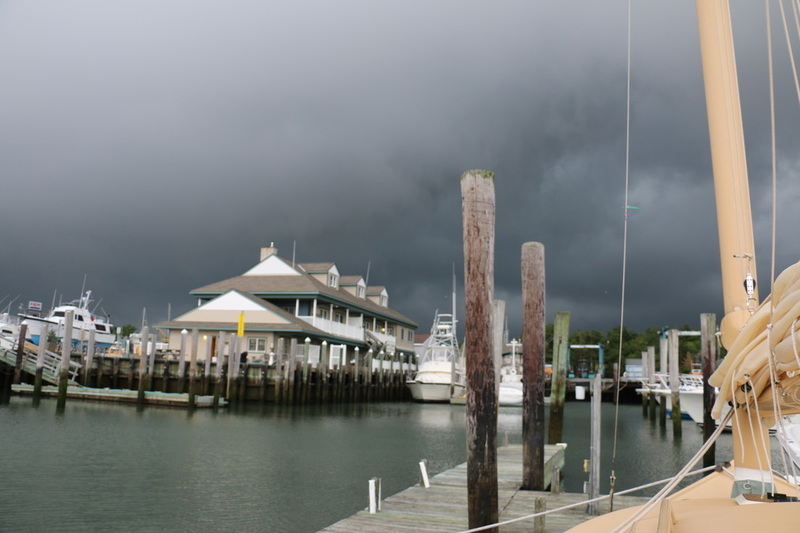 I got the boat ready and waited as several showers and fairly intense ones passed through. As I looked at the weather and wind forecast on my iPhone from the comfort of the Marina store I made the comment that the last shower would end in about 1 hour - that was at 1000, and sure enough at 1100 the rain stopped. Though all the other cruisers were averse to leaving and waited for the next day, I gave it a couple minutes before slipping my lines and heading out. I departed the slip at 1110 and cleared the Cape May Jetty about 35 minutes later. I lost track of time watching the fog that hovered around the base of the large radio tower on one side of the shore and the fog that hung over the jetty itself. Both quickly vanished as I felt a light breeze blow as I exited into the large ocean swells that greeted me along with two dolphin that followed be for a minute or two as I turned north to parallel the shore for a bit. With the forecast for West to NW winds and light (they sure were) and I made no attempt to sail until I knew it would be worth the effort. It never proved so for the next 50 hours. The waves initially turned a bit choppy, thought nothing like the Sunday before, and soon dissipated to the long rollers forecast in the reports – a very pleasant change. In the seas that seemingly pushed me along under engine alone, I regularly saw 4.9 to 6.3kts over the ground that would normally have been a bit over 5kts in steady seas. On average it seems I was getting helped north. Though there were others out that day, few were going my direction (no sailboats) and by night ever fewer were out except the commercial fishermen and me. Wednesday was a short day underway as it turned into the next day, just over 12 hours later. Thursday 17 July: Enroute Cape Cod. The night underway was uneventful and fairly easy since there were no sail to contend with and all that were out with me were fishermen who would appear and disappear, sometimes as quickly as I could find them - either visually by their lights or using the AIS - if they appeared at all. It was impossible to determine the heading of many since their running lights obstructed by the bright white lights that lit their decks. 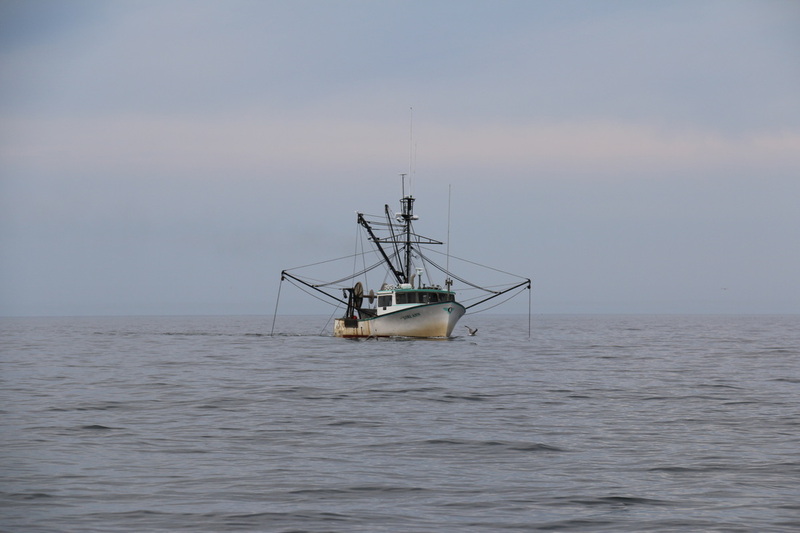 One large commercial fisherman I came in close to was lugging along under bright white lights, and at first I couldn't tell which direction he was heading until I got closer and we talked on the radio. I eventually could make out his bridge house and the large deck amidships and I waited for him to pass, listening to a very strange (and loud) engine noise that seemed to imply the ship was pulling a very heavy load or trawl and moving very slowly in so doing. Yes it was a long night and a long day at that too, and into the next. I did catnap and that seemed to work very well. As some might imagine sailing alone brings its own risks and requirements such as setting a good lookout. My plan as followed was to use the daytime to catnap when I could after scanning the horizon and the AIS for traffic, taking care of the boat in the daylight as needed and reserving the night for more formal sleep if you want to call it that. I again regularly scanned the horizon for lights and the AIS for boat traffic and used a timer when needed to wake me after 15 minutes. Doing that every hour gave me plenty of rest and having the autopilot (and testing it) the confidence to leave the wheel to my 2nd mate. I will say I never laid down but rested upright with my back turned slightly against the cockpit coaming so I would feel more readily any change in the boat that was unusual. It seemed to work. 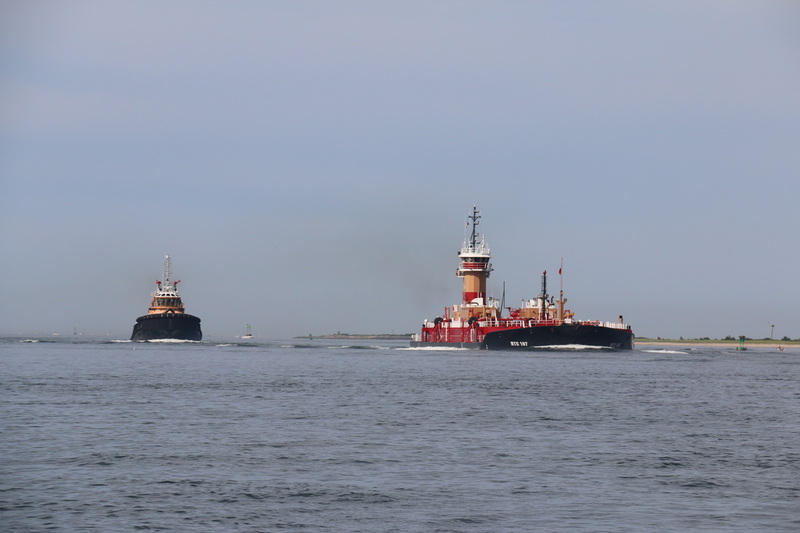 Friday 18 July: I arrived at the Buzzards Bay "entrance" about 0800 and headed north to the Canal entrance to get fuel and find a place to anchor for the night as I reassessed the weather and the next two days of travel. While heading up the bay I actually saw four other catboats (on a weekday at that), something I never saw on the Chesapeake, where I most often saw none at all. It was a long run up the bay and when I finally checked out an anchorage off Monument Beach I then left to find the fuel I’d need the next couple of days and then returned. The trip from Cape May to the Canal took almost exactly 50 hours (~250nm) and the next run was planned for even less (~190nm). It had been a very long time since I’d been in the vicinity of Cape Cod (late 1970’s). 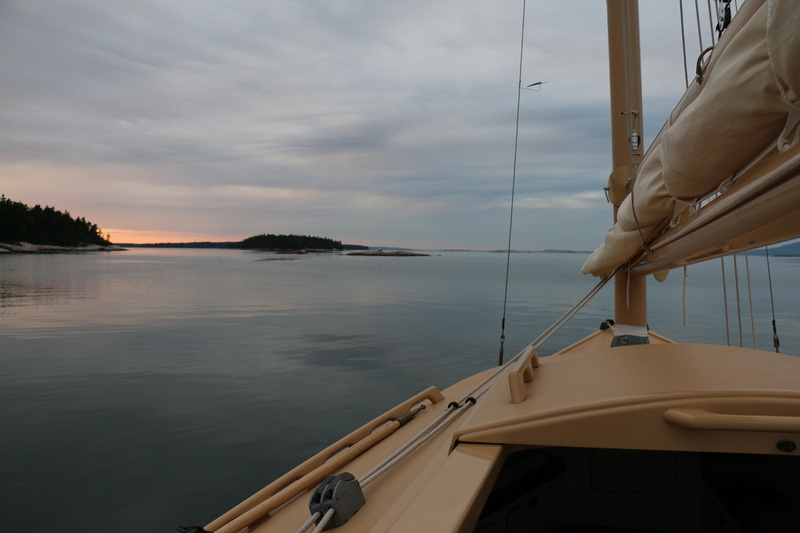 As I passed the Elizabeth Islands (held in Trust (a good thing) to preserve them from development) I almost decided to turn into the Cuttyhunk anchorage for the night – but did not. As I moved up the bay I noticed one Huge Mansion on the water but noticed another even larger further up the coast. I never checked but the lager and certainly more formidable one surely must be a Forbes mansion overlooking the Islands that lay vacant to its front across the bay. Saturday 19 July: I felt odd getting such a late start, but I had to wait for a favorable tide to make it through the canal. At 0830 I pulled up the anchor and headed for the canal making it under the railroad bridge after waiting for a large tug and fuel barge to pass. 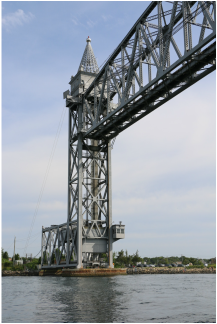 No sooner than you could say "train" (I had heard the horn in the distance) the bridge sounded its horn and the horizontally lifted span quickly lowered from 135' to only 7' above the water, effectively blocking anyone from entering or exiting until it was raised again. A couple of boats heading west (off cycle) with the tide were stuck until it passed and the span was raised again. The Cape Cod Canal was quite different from the C&D. I had never seen so many runners, walkers, sitters and fishers in that short one-hour run on the canal. With the current turning in my favor as planned, my over the ground speed was initially 3.7kts against the current but quickly rose to 7.3kts as I exited into Cape Cod Sound on the north side of the cape. I had vaguely remembered the canal from my last trip on it in 1979 but surely it changed – a lot. On the C&D there is no canal path or even a need for one, since it is not as residential an area as is the cape. There still was no wind but my 18hp Yanmar was working reliably and with no complaints, so I made a course correction and headed direct to Matinicus Rock, over 119 Miles away, passing Race Point and Provincetown before exiting the sound into the Gulf of Maine and the open ocean. I was able to raise the sail and motor sail for about 5 hours and than gave up the quest when the wind all but died and it was no longer useful. All went well that night until about 0300, just before I was going to add more fuel to my tank – a couple hours later than planned. Shortly after 0300 my engine started to sputter and I quickly recognized what I believed was a fuel problem. I immediately shut down the engine to assess the problem “remembering” that I had filled the 12-gallon tank the day before entering the canal – or so I thought. I then grabbed one of my three remaining five-gallon containers to give me some margin and then attempted a restart - which failed. Quickly bleeding and successfully restarting the engine, I added another five-gallon container… and then part of another. I then remembered that I had been distracted when filling the tank by a loud speedboat that was lumbering next to me and then by a high pitched whine from a water hose at the dock as the water ran and was secured by another boater. I now realized the sound I heard of my quickly filling tank was nothing more than air escaping combined with the external noises that distracted me. My mistake and not using my sounding stick was certainly not a smart thing to do! Despite the shorter run to Maine than to the Cape in the prior phase of the trip, I would - for some period of time - be almost 50nm offshore in my small 23ft catboat, with at least 10hrs to a suitable divert location. It was something to think about at least, but I felt I was ready and so was the boat. I did have the tunes sounding in my ears - Rock Lobster (B-52's) – and how fitting. That night and the next day were both very quiet with very little boat traffic, except a very rare commercial fisherman and the occasional sunfish fin raised on the surface. Quite interesting fish which are slow moving and very docile. I’d seen my first in Cuttyhunk Harbor many years ago. Even the longer ocean swells (8-9 seconds and 2-3 foot height) were less than I'd seen in the previous days south of the cape and did not grow much larger. All was as forecast. 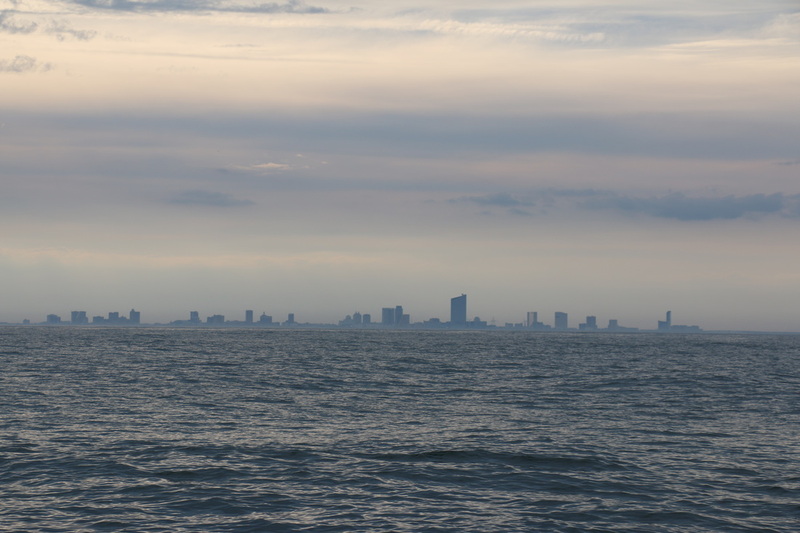 I did come upon two separate but related things in the Gulf that bothered me. The 1st was a yellow rubber balloon and the 2nd a star shaped metallic "balloon" with red, yellow and other colors, both floating from 10-20 miles offshore, north of the Provincetown area. They were party balloons that had floated free (intentionally or not - doesn't matter) and should not have been there. Something to think about if one releases a balloon at a party. Sunday 20 July: Enroute Maine. 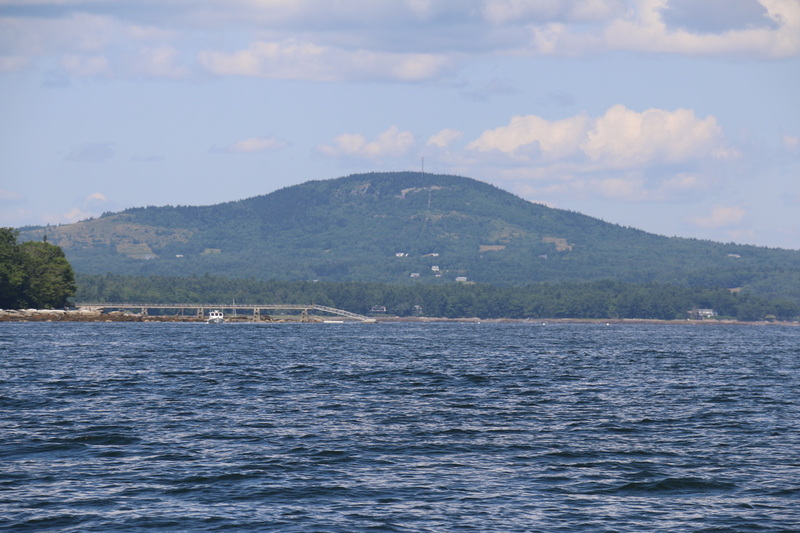 My course was made direct across the Gulf of Maine from the Cape to pass Matinicus Rock, which I had not seen before and did so at about 1330. The time was hard to assess since it took so long to pass the rock. 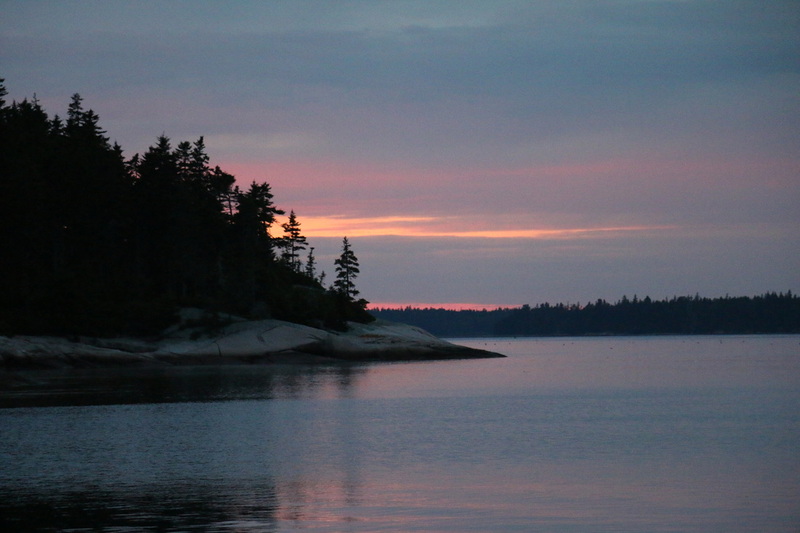 At that point I began to reassess my time to Blue Hill and knew I couldn't make my mooring until well after dark so I made a decision based on the tide and decided to make Swan's Island and Mackerel Cove. Hoping to get there before sunset. I saw no commercial traffic and few pleasure boaters in that part of the coast and only the common seabirds and one whale (a minke I believe), as well as floating seaweed - some in long debris fields caused by the current. I passed through one that seemed to cause my boat speed to drop and I assumed it was nothing more than a change in the current, but dismissed it. That decision to make for Swan's Island was a good one. Though I had to traverse a minefield of lobster buoys upon entering the Swans Island area. 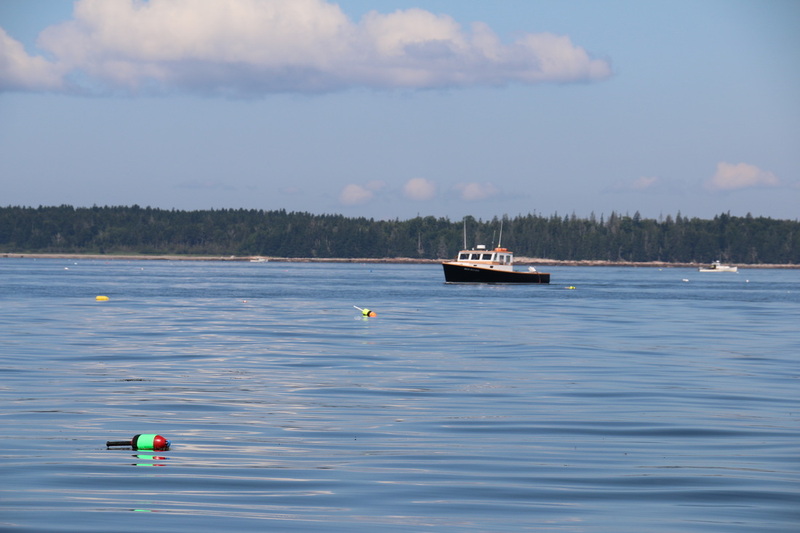 The sheer number of brightly colored and diverse lobster buoys was more than I was used to in Blue Hill and I was certainly glad our home waters on Blue Hill Bay were not that encumbered. I safely made it to Mackerel Cove and anchored at 1950 in a well-protected anchorage from all directions but the east, with plenty of time and light to still cook dinner and relax a bit before sleep. Internet coverage was poor so I had a great excuse for not updating my web site... I looked due east to Mt. Desert and its beautiful mountains and hills, which was a fitting end to my final full day on the water. Monday 21 July: Arrive Blue Hill.... and I did! I got up at about 0600 despite every intent to be lazy and sleep longer, but it was hard to do waking to the sound of work (lobstermen) and feeling the soft rolling of the boat from their wake(s) as they moved from trap to trap, releasing their load of lobster - or one would hope. I got up and worked my chores in preparation for a planned arrival at Kollegewidgwok Yacht Club (KYC) to unload the boat and get to its new mooring. No more marinas or private slips, and in the fall, the boat’s first time out of the water for any period of time since new in 2003. My first task was to empty all the diesel jugs of their valuable fuel and then check it's fill level with my trusty measuring dowel, which clearly showed me I had less than 5 gallons remaining. With the three hour run to Blue Hill I was OK! Next cleaning the transom of the exhaust soot and check the prop just for grins - YEP, there is was -the cause of what I had questioned in my slight change in boat speed the day before after passing through a bunch of seaweed and debris brought together by the currents. Pressed down by the seaweed, to a depth close to my prop, had been a nice PINK Poly line (that would normally float at the surface). There it was, caught on the blades of the 2-bladed prop, along with some seaweed to make it blend in better. I got my knife and leaned over my large rudder to cut it free but then thought, why not just try to untwist it... and sure enough, after about 20 left-hand twists of my wrist the line pulled free, and then with some toe tugging of the seaweed, my prop was free as well. Cleaning the transom, a quick cockpit shower, hot coffee and a breakfast bar, as well as the packing of everything I needed to get off the boat, resulted in my 0940 departure from the cove on a glass calm and beautifully warm (55 degree) sunny morning. 21 lobster boats could easily be counted with the naked eye. With binoculars I counted over 40! 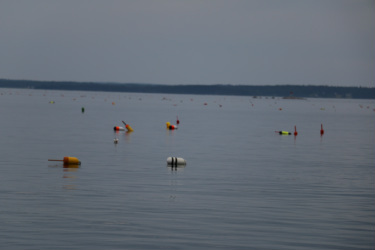 That was no surprise with the number of colorful buoys covering the water's surface as far as I could see. 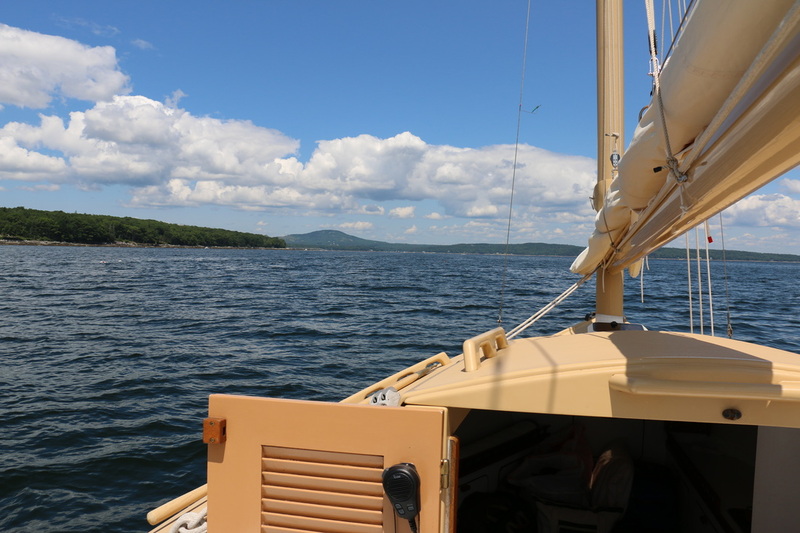 My boat speed was back to normal and I made a leisurely run up Blue Hill Bay passing Tinker to Port and Long Island to Starboard, taking in the clean warm air (I know 55 may not seem warm, but it feels warmer in Maine than Maryland - trust me. ), and the bright sunshine. 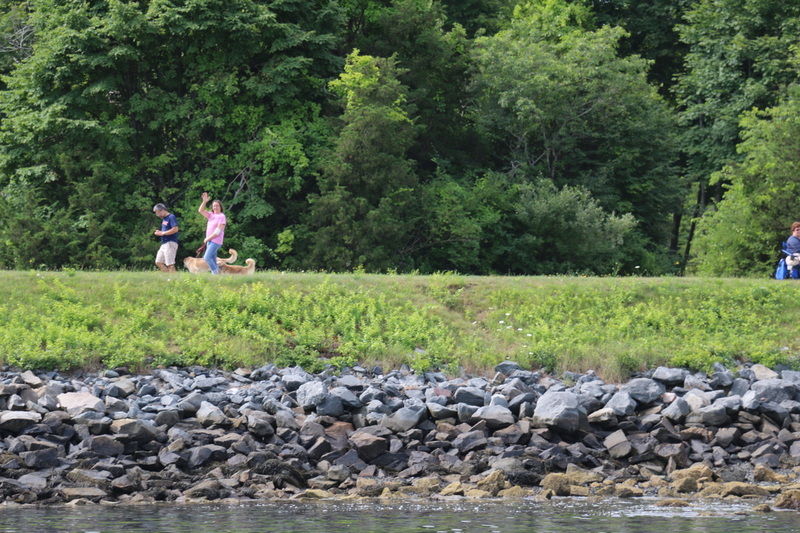 Before getting to the Blue Hill Harbor I turned into the small cove on which our family house sits, just to check it out at low tide and see if our mooring there was ready. And there two were - not the two dolphin that saw me off at the Cape May jetty, but close enough - two smaller harbor porpoise welcoming me home after the more than 600nm journey. Oh yea - went sailing the next day on Blue Hill Bay in approximately 15 its of wind and I KNOW that was the best couple of hours sailing I had in a VERY long time. Twelve years at least! Conary Cove near Blue Hill Falls, Maine. Caerulean III was sold in 2016 and made it's way south to Naples, FL via trailer. That "Epic" event will be documented in a separate article, whose intent will be to identify things to do and NOT to do when having a boat transported overland - especially by a boat hauler. 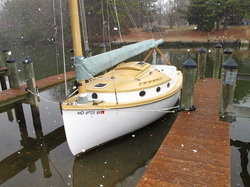 The good news is she arrived A-OK and is being used for day-sails, cruising and racing against larger boats, such as what I was able to do in Maine using her PHRF rating! EXCELLENT! CAERULEAN III also survived Hurricane IRMA this past summer - more on that and the specifics of wind and preparations later. Two Lunches and a Selfie: Just to rub it in. 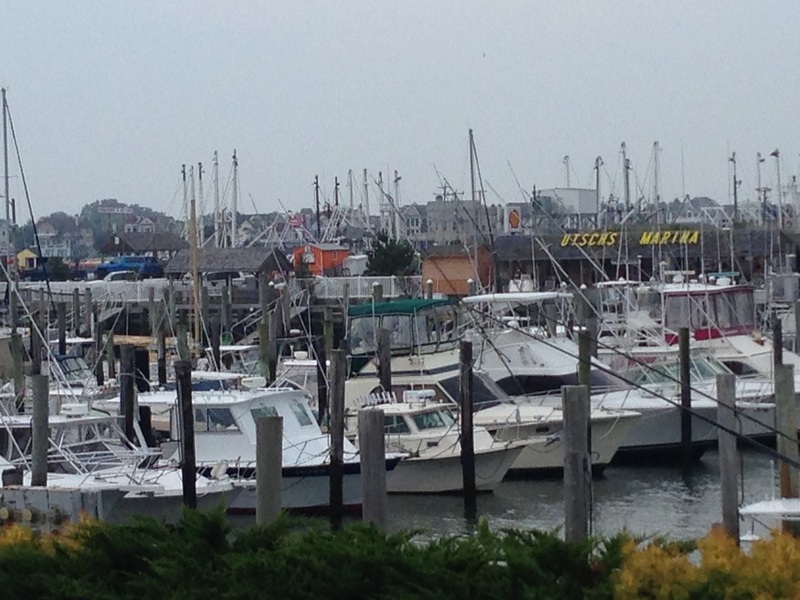 Utsch's Marina: Picked the right place! At Utsch's: Waiting for the last storm to pass then departed... passing Atlantic City, and the only southbound travelers. Sunset - first night on the water. Anchorage before transiting Cape Cod Canal. Law of Gross Tonnage - I let them go through first! Railroad Bridge was open and people actually waved! Those that were working were fishing. Lotsa Pots! Arrived late at Swans Island and worth it. 3 hrs from Blue Hill. Working Boats - the next AM. Blue Hill - the Mountain. 3. Conary Cove near Blue Hill Falls, Maine. Eggemoggin Reach Regatta - The Start!